Starting a career in sales? Make sure your resume fully conveys your key competencies and motivation to succeed. This sample will show you how. On the hunt for sales jobs? Your options are plentiful! Because nearly every industry relies on a sales department to keep business afloat, you can search for jobs in a variety of fields. But no matter what direction you start out in, you must make sure your resume conveys your key competencies and motivation to succeed. 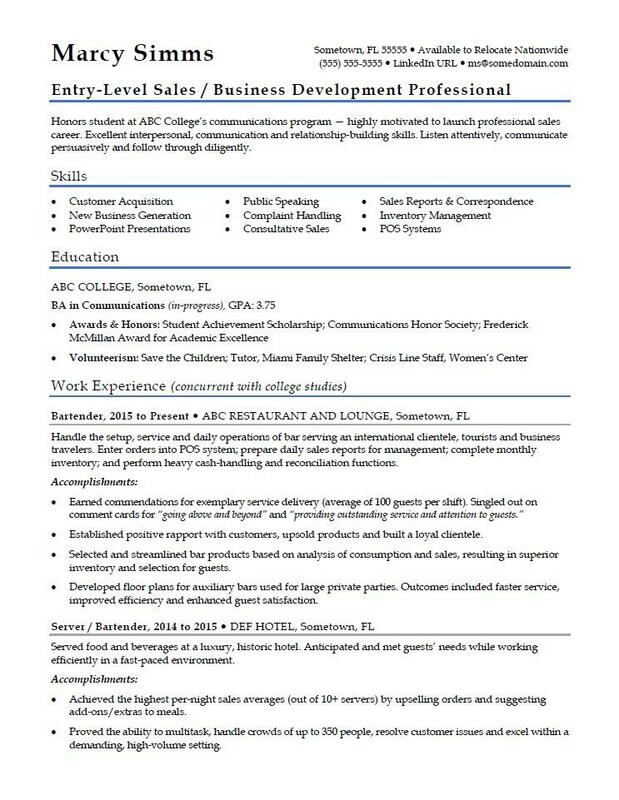 For inspiration, view the sample resume for a salesperson below, and download the entry-level sales professional resume template in Word. According to the Bureau of Labor Statistics (BLS), you'll find the highest level of employment for advertising sales jobs in the following states: New York, California, Florida, Illinois, and Texas; and in the following metropolitan areas: New York City, Chicago, Los Angeles, Atlanta, and Boston. As a salesperson, you can expect to earn a median wage of $49,680 per year, or $23.89 per hour, according to the BLS, though you'll obviously earn less in an entry-level position. Honors student at ABC College’s communications program — highly motivated to launch professional sales career. Excellent interpersonal, communication and relationship-building skills. Listen attentively, communicate persuasively and follow through diligently. Handle the setup, service and daily operations of bar serving an international clientele, tourists and business travelers. Enter orders into POS system; prepare daily sales reports for management; complete monthly inventory; and perform heavy cash-handling and reconciliation functions. Established positive rapport with customers, upsold products and built a loyal clientele. Selected and streamlined bar products based on analysis of consumption and sales, resulting in superior inventory and selection for guests. Developed floor plans for auxiliary bars used for large private parties. Outcomes included faster service, improved efficiency and enhanced guest satisfaction. Served food and beverages at a luxury, historic hotel. Anticipated and met guests’ needs while working efficiently in a fast-paced environment. Achieved the highest per-night sales averages (out of 10+ servers) by upselling orders and suggesting add-ons/extras to meals. Proved the ability to multitask, handle crowds of up to 350 people, resolve customer issues and excel within a demanding, high-volume setting. Starting out in any industry is a challenge, but a solid resume can help you get a foot in the door. Not sure your sales resume has what it takes to impress a hiring manager? Get a free resume evaluation today from the experts at Monster's Resume Writing Service. You'll get detailed feedback in two business days, including a review of your resume's appearance and content, and a prediction of a recruiter's first impression. Let the experts at Monster give you an edge and help you land a great new job.